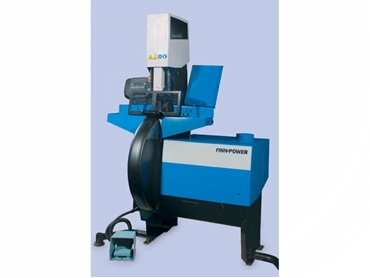 Finn-Power CM75 and CM91 hose cutting machines available from Powerco Crimping Australasia are designed to cut all types of hoses up to 2” and 3” in diameter. Protected by a metal safety guard, the 520/650 mm diameter blades operate at 3000 rpm with the hose pushed against the blade by a pneumatic cylinder (CM75) or a spindle motor (CM91). Piston movement speed can be quickly and easily adjusted to choose optimal cutting speed for each type of hose. Lower speeds are used with thick hoses to avoid overheating of the blade. The blade can be re-sharpened when required. A built-in bin has been provided in the hose cutting machines for the collection of cutting waste.